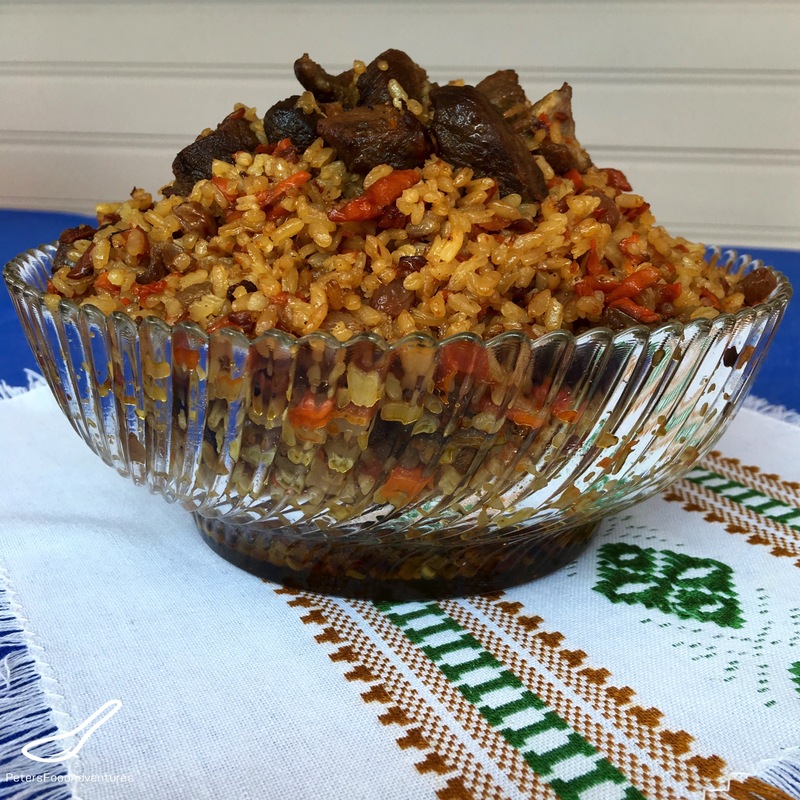 This Palava Pilaf Recipe (Плов) is my favourite Russian comfort food, but is commonly accepted as an Uzbek dish, but all former Soviet Republics enjoy Plov with many variations. Traditionally, it’s cooked by the man of the house, and is popular for weddings. But we eat it all the time for dinner, usually with dill pickles or with my Salted Pickled Tomatoes which go perfectly with Palava Pilaf. Cumin, coriander and spices are quite common, but my mum never liked heavy spices and stuck to basics. Why Do We Call It Palava instead of Plov? My parents were born in North West China (just south of the Soviet Union), right beside Tajikistan, which is where the influence of the word Palava came from. In Tajikistan it’s called Palav (Палав), but Plov is the correct Russian name. 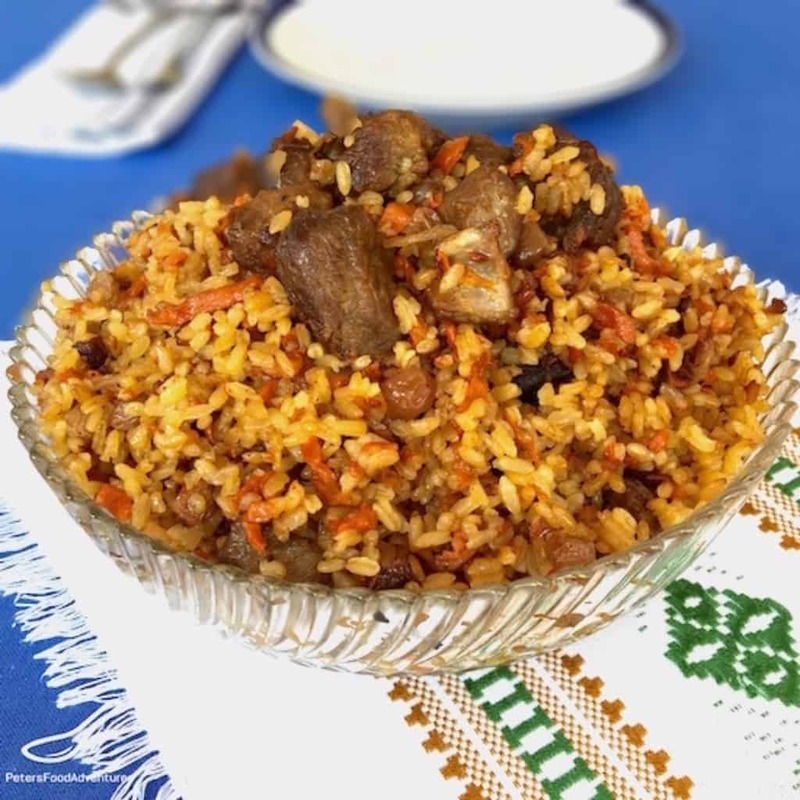 Worldwide, there are many versions of Pilaf, known as pilav, pilau, pelau, pulao, pulaav, palaw, palace, palava, plov, palov, polov, polo, polu, kurysh. No one culture really owns this word as there are many names and subcultures to the recipe. I remember someone telling me that Palava isn’t a word, how misinformed they are about how many pilaf recipes there are! This Palava Pilaf recipe can also be made with dried apricots, raisins, and less commonly with dried cranberries, prunes, and even barberries. As a kid, I absolutely hated eating the raisins in Palava and always picked them out. My sister loved the raisins and mum always included them, maybe it was her way of trying to make me eat more fruit! This is my mum’s Palava Pilaf recipe, but my wife makes Plov a little differently from my mum, which I absolutely love and will post soon. My mum insists that the rice used must be no larger than medium grain rice, definitely not long grain rice. She actually uses Kokuho Rose Short Grain Rice, marketed as a sushi rice in Australia, and costs a fortune here (as it’s imported from California). Plov is commonly made with long grain rice, it’s your choice. It’s funny how little differences across regions change a dish. Mum’s Palava Pilaf recipe has a really lovely dark colour through the rice, compared to many plov recipes. The secret to a colourful and flavourful Palava Pilaf recipe is not adding turmeric, cumin or flavours, but it’s ensuring you have plenty of fried carrots and lots of oil. Many Plov dishes can be quite light in colour, and sometimes light in flavour. The flavour is in the fried oil, the colour from the carrots. The trick is to get the balance right, too much oil makes it oily, and not enough oil loses flavour. So you could make a healthier version of this Palava Pilaf Recipe, skim on the oil and add extra spices, but it wouldn’t taste the same. Russians aren’t skinny, oil free kind of people anyways, why would I try to start that now? Bon Appetit! Приятного аппетита! In a frying pan over high heat, add oil and fry the onions until they are caramelized and well done, about 8-10 minutes. Set aside. Add about 1 cup of oil in a frying pan, and fry carrots for about 8-10 minutes. Carrots must be well cooked and caramelized, but not burnt. Set aside. There should be about ½ cup of oil in the frying pan, use the leftover oil from the carrots if it's there, add if necessary. Heat as the frying pan until oil is almost smoking, and fry the cubed beef for about 8-10 minutes. The water from the meat must be released, then cooked out, allowing the beef to be a deep golden brown colour. Add about 1 tsp salt and ½ tsp pepper to the beef only after the water has been released or season to taste. Add the fried onions and fried carrots and the beef to a large stock pot. There should be a generous covering of flavourful oil in the bottom of the pan. Too much oil and the Palava will be oily, too little oil and it will lack flavour. Wash the medium grain rice several times, until all the starch is washed away and the water runs clear. Add the rice to the meat mixture. Using about ½ cup of water, deglaze the frying pan and add to the stock pot. Add 3½ cups of boiling water to the stock pot. Add 1 cup of raisins and 1 - 1 1/2 teaspoons of salt to the mix. Bring water to a boil and cook for a few minutes, until the water starts to absorb. Mix it all together, scraping from the bottom for a final mix (some recipes say not to, but it's going to be ok, I promise). Place the lid on the stock pot and reduce heat to low. Simmer for about 15 minutes until rice is cooked and fluffy. Enjoy with dill pickles and with pickled tomatoes. Mmmmm intersting – sounds like Pavlova – I’m just kidding 😀 Dried apricots, cranberries and prunes must be nice nice together. Now I’m thinking about making it in a rice cooker. It definitely works in a rice cooker! I’d be careful how much fruit I’d put in and maybe keep it to only raisins or maybe apricots more traditionally, as the fruit only plays a minor role. I love it without any raisins or fruit! ??? ?Let me know how it goes! Sure. First I will try with raisins only! Just wondering if I put Vegata in…. Haven’t bought yet though…. No, we’ve never used Vegeta in this. Salt and pepper is all it needs ???? Lol, thanks Lynne! Another family favourite, and an easy one pot meal! ???? Lovely recipe, Peter! So enjoy the sweet & savory!